different, such as economic betterment, political upheaval, and education. When people migrate from one nation to other, they carry their culture and traditions with them with a sense of distress, dislocation and displacement. While they try to settle down in a new land, they have to adopt that culture and during this process of assimilation their cultural identities losses somewhere in midst of their ‘hanging’ lives. This identity loss leads them to fragmented identities and they begin to loss their social bonds as well as culture of their homeland. This situation of brain drain leads them to psychological trauma and they begin to raise questions on their own existence, this result in existential crisis. 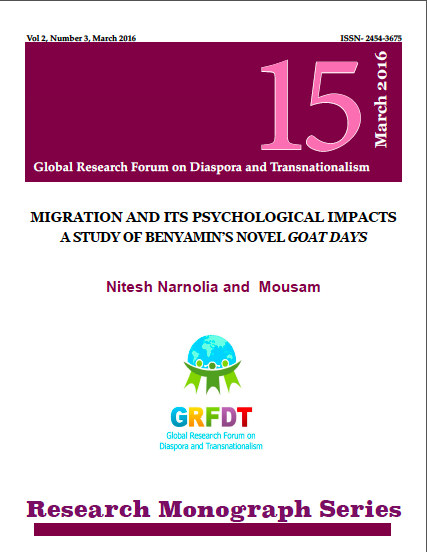 This paper tries to understand the social, cultural and psychological impacts of migration through the study of Benyamin’s novel Goat Days. The novel depicts the life of Najeeb Muhammad, an Indian emigrant whose dream was to work in the Persian Gulf states and earn enough money to send back at home. But, he achieves his dream only to be destroyed by a series of incidents which led him into a slave-like existence herding goats in the middle of the Saudi desert. This paper attempts to explore the existential crisis of the protagonist, Najeeb, in Benyamin’s Aadu Jeevitham, translated in English by Joseph Koyippally under the title Goat Days. It aims to analyse his crisis on the basis of transformation in his social, cultural and psychological state which leads him to existential crisis.